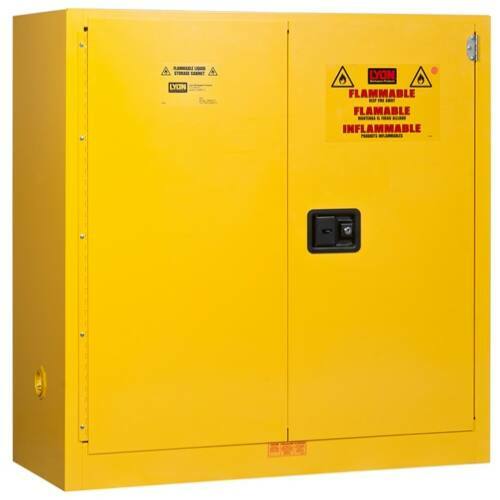 The 74R5441N is a 30-Gallon Flammable Liquid Storage Cabinet with Self-Closing Doors. This cabinet measures 43" wide x 18" deep x 44" high. The 74R5441N offers a single operated door equipped with Self-Closing feature. The door is equipped with a three-point locking system, which includes a black, flush-mounted paddle handle design and a double key set, which can be padlocked (padlock not included) for added security. The Self-Closing Door feature is a manual latch with a fusible link. The latch holds the door open when in use and will release to close the door automatically when temperatures reach 165Ã‚Â°F (73.88Ã‚Â°C). This cabinet is designed to be free standing. The 74R5441N is constructed from 18-gauge steel with reinforced double panel walls. these double paneled walls provide 1-1/2" of air space between the inner and outer walls for maximum fire protection. This cabinet is equipped with two flame resistor vents one on each side of the cabinet. Flame resistor vents designed with 2" threaded fittings with a fire baffle and cap, allowing for an external exhaust when required. Grounding wire connections are standard to help dissipate any build-up of static electricity (Ground Chains Purchased Separate). The 74R5441N offers a 2" leak-proof bottom pan, in case of accidental leaks and spills. This 30 gallon flammable liquid storage cabinet is provided with four adjustable Zinc plated leveling legs. Affixed to the cabinet are Large Warning Labels to aid in compliance of storage and handling. The 74R5441N Cabinet meets OSHA and NFPA Fire Code No.30 standards.